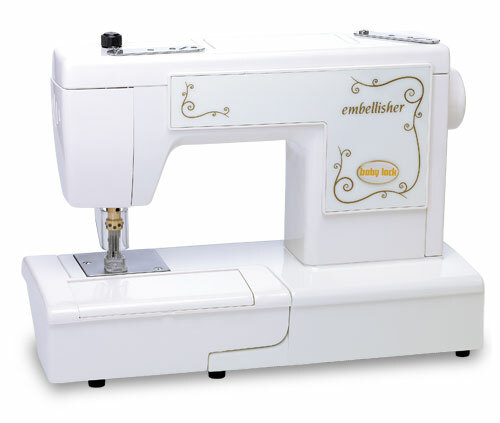 Baby Lock Embellisher Sewing Machine available at Moore's Sewing. If you’re looking for a technique to make your projects stand out in a crowd, then the Embellisher is the machine for you. 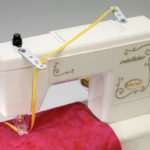 Sewers, quilters, crafters and embroidery lovers all appreciate the extra touch that this machine can bring to any project. The Baby Lock Embellisher uses the unique art of European needle felting to create incredible detail and texture using absolutely no thread! You can even remove any of the needles or use all 12 for free-motion embellishments of any size. No matter what your style is, you’ll love what the Baby Lock Embellisher can do for you. For the Love of Sewing. Finger Guard ~ Get as close as you’d like– the clear finger guard protects your hands from the needle without blocking your visibility. Cloth Presser ~ The built-in cloth presser stabilizes fabric for control and precision while free-motion embellishing. 12 Needles ~ The barbed needles mesh fabric together without using thread. Customize the size of your surface area by adding or removing any of the 12 needles. Yarn Port ~ Avoid tangles with the convenient yarn port, which continuously feeds yarn (up to 4mm in diameter) directly through the machine to the needles. Yarn and Ribbon Stand ~ Control spools of yarn or ribbon as you embellish with the attached stand. This stand helps keep materials by your side and tangle-free for easy feeding. Ribbon Guide ~ The ribbon guide holds ribbon (up to 10mm wide) in front of the machine to keep it twist free and under control while feeding.